It’s a common scene along Denver’s sidewalks: tangled bikes locked up to trees, gates, or parking meters, creeping into the path of pedestrians. Without proper bike racks, bike riders have no other choice. 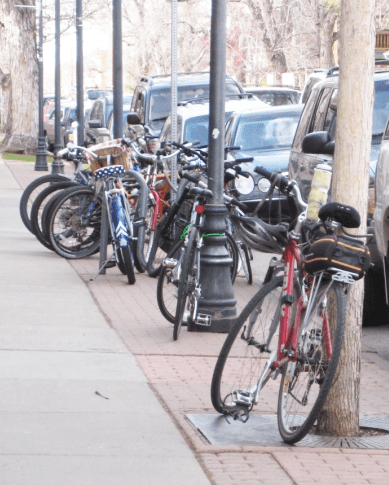 It should get easier to lock up your bike with a new program from the Department of Public Works that will supply some businesses with free sidewalk bike racks and others with bike corrals (rows of bike racks in the street). It’s a no-brainer for a city aiming to increase cycling. Taking advantage of the program is also a no-brainer for any business that likes money, which I’m betting is all of them. Shoppers and diners who arrive on bikes spend 24 percent more per month than those who arrive by car, according to DPW. Here’s how it works: Businesses can apply online for standard U-shaped racks, a bike corral, or an “alternate” rack. Bike corrals are certainly the sexiest option, and they’ll reward any business that invests the $1,000 to install them. The U-racks are free for businesses who qualify, but supplies are limited: DPW has $90,000 for the program this year and $50,000 for the year after. Planners have mapped the areas they say has high demand for bike parking, and businesses in those neighborhoods will receive priority. The city began accepting applications last week, said Dan Raine, a senior city planner, and has room for way more. The city has received only 12 inquiries and two completed applications since it began accepting them last Friday. The deadline to apply is May 28. The city will install bike racks twice a year — Labor Day and Memorial Day. 1. Stated demand: portion of the application where an applicant is going to show availability and potential over-parking of bikes (bikes locked to trees, benches, railings, etc). 2. Land use generated demand: the attached map was created with available data that drives bicycle use such as employment density, population density, bike facilities, and retail/dining establishments (aka destinations). This is an objective analysis that serves as a tool for understanding demand and prioritizing. 3. Equity demand: collecting applications and making decisions at 2 points during the year, so that we can make sure we place bike parking throughout the City.